Are you in an older home without air conditioning? Have you been relying on noisy window air conditioners? Is your central air conditioner overdue to be replaced? No matter what your air conditioning needs are, switching to a ductless AC unit could be the answer. Whether you have a family or live with roommates, if there's more than one person in your home, you've probably had a fight over the thermostat at least once. Unlike traditional air conditioners that only have one central cooling system and one central thermostat, ductless air conditioners have pairs of indoor and outdoor units for each room in your home. The system for each room runs independently, so everyone can set their own room to their preferred temperature. One of the most wasteful things about central air conditioning is that it cools every single room in your home. If everyone is downstairs for dinner, the upstairs floors are still being cooled. If west-facing rooms need air conditioning to help with heat from the afternoon sun, east-facing rooms also have to be cooled. Because ductless ACs work room by room, you only need to turn them on when you need them. Your spare bedroom can be left at a constant 85 degrees, and you can crank your own bedroom down to 70 degrees at night without guilt because you turned the rest of the house up. By only cooling a fraction of your home at a time, you'll only pay a fraction of the costs. Ductless air conditioners help clean your air in two ways. First, dust and dirt that manages to get by your air filter collects in your ducts over the years, and your ducts may pull in even more dust from the attic if they develop a leak. By going ductless, you eliminate these sources of contaminants. Second, by having a blower unit and filter in each room, you eliminate pockets of stale and dusty air that develop when a room is too far away from the central intake vent for its suction to have a strong effect. 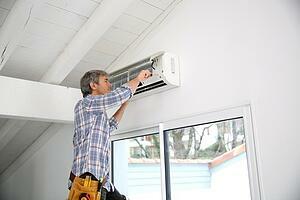 Ductless air conditioners are also incredibly easy to install. Each indoor unit is hung on a wall or placed on the floor, and the outdoor units are connected by a small tube that runs through your wall. There is no need to rip apart your ceiling or walls to add ducts in a home that doesn't have them, no need to replace old ducts that are too small or too leaky, and no need to worry about ruining the character of a historic home that was built before air conditioning was invented. A trained HVAC professional can often complete the entire installation in just a few hours.